Mars, the Red Planet, fourth planet from the Sun, forever linked with 19th and 20th Century fantasy of a bellicose, intelligent Martian civilization. The romance and excitement of that fiction remains today, even as technologically sophisticated robotic orbiters, landers, and rovers seek to unveil Mars’ secrets; but so far, they have yet to find evidence of life. The aura of excitement, though, is justified for another reason: Mars is a very special place. It is the only planetary surface in the Solar System where humans, once free from the bounds of Earth, might hope to establish habitable, self-sufficient colonies. Endowed with an insatiable drive, focused motivation, and a keen sense of exploration and adventure, humans will undergo the extremes of physical hardship and danger to push the envelope, to do what has not yet been done. Because of their very nature, there is little doubt that humans will in fact conquer Mars. But even earth-bound extremes, such those experienced by the early polar explorers, may seem like a walk in the park compared to future experiences on Mars. Mars is a small planet, with a radius about half that of Earth, but it is a place of extremes. The temperature can fall to a low of -140°C (-220°F) in polar winter, but seem an almost pleasant 20°C (68°F) in tropic summer. The atmosphere is thin. Even at the surface, Mars’ atmospheric pressure is comparable to Earth’s at an altitude of 35 km (22 miles), but with an extreme difference in composition. The atmosphere of Mars is 95.7% carbon dioxide with just 0.2% oxygen. There is no magnetic field to divert the solar wind, although much is stopped by interactions in the upper atmosphere. And, the surface is windy, very windy; dust storms are common occurrences which can upon occasion envelop the entire planet. But water does in fact occur, and that’s what makes the establishment of habitable, self-sufficient colonies on Mars feasible. The once seemingly impossible dream is on the way to becoming reality. The first steps have been taken; the robots are exploring Mars. Now, the planning begins in earnest. Future self-sufficient colonies will need energy and material resources. 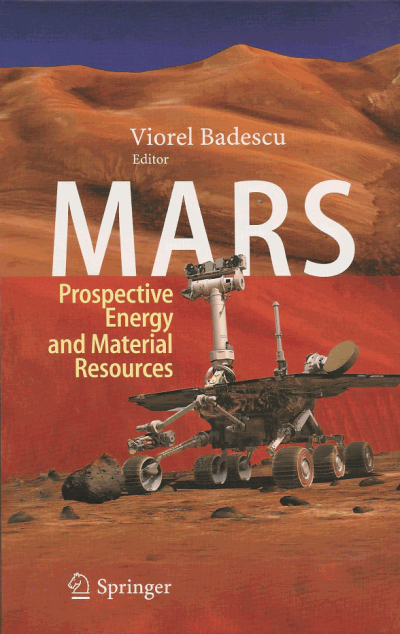 The planning for those needs, already begun, is the theme and focus of this book: Mars: Prospective Energy and Material Resources. We have to welcome this initiative of Springer and the highly appreciated effort of Professor Viorel Badescu to collect twenty-six chapters, written by selected experts in the field.